The Samsung Galaxy Rugby LTE (model number: SGH-i547c), an upgraded version of the original Galaxy Rugby smartphone, will be available in Bell and TELUS from 1st November onwards. Samsung stated that it sports all adorable aspects of an android powered smartphones, along with the little rugged features. One interesting thing about this Samsung Galaxy Rugby Pro is; it is resistant to shock, dust,humidity, rain, solar radiation and transport. It has a customizable key, which can be used to switch on the torch, launch the camera, or some other tasks you can select from. Galaxy Rugby Pro comes integrated with EAS corporate e-mail support, device encryption as well as enhanced push-to-talk. 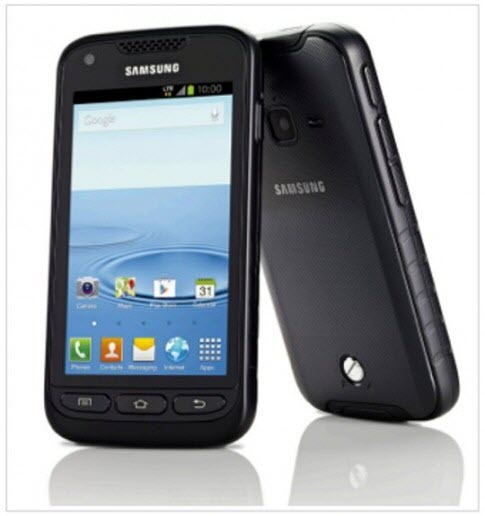 The Samsung Galaxy Rugby LTE is powered with Android (Ice Cream Sandwich) operating system. It comes with a huge 4 inch Super AMOLED display with 480X800 pixels of resolution. It has 5 mega pixel rear-facing camera that can even capture 720p video. Other features includes 3G/4G LTE and Wi-Fi connectivity, Bluetooth, GPS, DLNA, VGA Secondary camera, micro USB 2.0, 1,850 mAh Battery, a microSD card slot for memory expansion upto 32 GB. It does not reveal any price details. Initially the phone will comes in Black color, however more colors will be added in the near future.